I know that it may not feel like it, but summer is around the corner. Memorial Day Weekend is less than two weeks away, so that means it is time to start thinking about your summer wardrobe! It will soon be the time for sundresses and sandals! I was recently introduced to Tobi, an online fashion retailer! I had never gotten anything from them before now, but this week I have a lot in store for you that I am very excited to share! I will be posting a few different looks all based around pieces from their website. Each outfit I will be sharing is perfect for the warmer days that we have ahead of us! First up is the fun linen sundress that I styled below. I kept this look fairly simple, as the dress has enough going on with the cutout midriff. 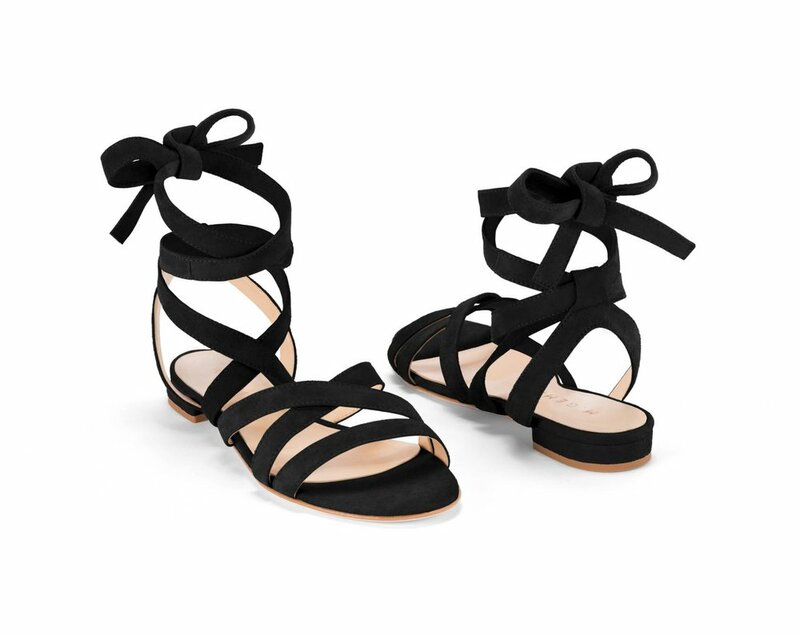 I also paired it with these fun lace-up sandals, which are the perfect accessory to dress up the simple black! The sandals I am wearing have been a fixture in my close for a couple of summers, but I linked similar options at the end of this post for you. While you're there, you can shop the rest of this look too! Stay tuned for two other looks from Tobi that I'll be sharing later this week as well! I must say that I was very pleasantly surprised at how much I loved everything I got from them. I have spoken before, about how I am usually hesitant to order things online from brands I have never bought before. There is usually a lot of risk that can be involved in this. It can be hard to know the fit and quality, which are all very important when purchasing things to add to your wardrobe. Everything I got from Tobi fit well and was good quality for the price that it is worth. Oh yeah, did I mention that their prices are amazing, especially if you are on a budget like yours truly! One other element that I added to this look are the earrings that you see in the close-up shots below. These earrings are from another online retailer called Puck and Abby. Puck and Abby is a website that specializes in selling handmade goods. They have everything from jewelry and leather goods to beauty products and home decor. When I first saw the site, I wanted everything, and I feel like you all will to! There really isn't anything better than supporting local business and artisans, so go and check out the site...you won't be disappointed. They were also very kind to give all of my followers 25% off of any purchases that they make. Use the code SIXFEETINHEELS if you see anything you like! !